CheckOutMyCards.com has grown almost exclusively by word of mouth and organic search results. We only purchased two Beckett ads in our first 5 years. Now we want to get the word out regarding our investment in the new COMC.com, so we recently inked a deal with Beckett to be listed in every single printed publication they have in the next year. This is more than 60 publications. We will have either a full page or a quarter page ad in every single one. All of the most popular publications (Baseball Monthly, Sports Card Monthly, and all of the yearly almanacs) will have full page ads. We are pursuing many more advertising opportunities as well. We want everyone to know that COMC is here to help with their collecting and consignment needs. To celebrate five years of our innovative consignment service, we are offering a flat rate processing special. Get whatever fits in a 550ct box processed in 5 weeks for only $55. The second box has extra cards stuffed in along the side and cards lying on top. This is not allowed. It it too easy for the cards to get damaged in transit when doing this. We’ll have free 550 ct boxes at booth #2440 to give away. You are welcome to use them for the special or for whatever you need. We’ll have some other goodies to give away as well, so please swing by and say “hi”! If you have any comments, suggestions, concerns, or other ideas you would like to discuss with me in person, I will be available all week at the National. You are invited to schedule a half an hour face to face. Simply send an email to timewithtim@comc.com letting us know your availability, and we’ll schedule it. Thank you for reading such a long series of posts. I hope this has given some valuable insight regarding our motivation and direction. As I mentioned, there is still a lot more to come. I look forward to everyone’s continued engagement in our ongoing conversation. Your productive feedback helps make the site successful for everyone. Well done guys, thanks for all the hard work. About time with the advertising. But I expect a lot more with the revenue you guys are pulling in. A lot more. You need online advertising. Get the customers that already have their browsers open. Yep, we have already started buying some online ads, and I am sure we will continue to do a lot more there as we launch more services on COMC.com. would you guys be willing to tell us because i’m curious if paypal charges COMC when store credit is added? This next question may be harder, what does beckett charge you for the price guide? I’m guessing its not the standard fee for a regular member. Yep, here is a list of *some* of the expenses we have. Yes, PayPal charges us 2-5% per payment. $10 store credit costs us $0.50, but $100 store credit only costs us $2.20. Payments from outside the united states are about an extra 1% more expensive. All of these fees are absorbed by the fees we charge. We pay Beckett to license their data. Thanks for the reply and thanks for paying my paypal fees. You guys seem to have alot of bills so I personally don’t mind paying >25 in processing, but lets leave it there for awhile. If one does not have a 550 count box can say a 660 count box be sent with no more than 550 cards in it? As long as it is packed neatly and not crammed in? Yes and no. You can use a 660ct box, but we will transfer the cards into a 550ct box when they get here. 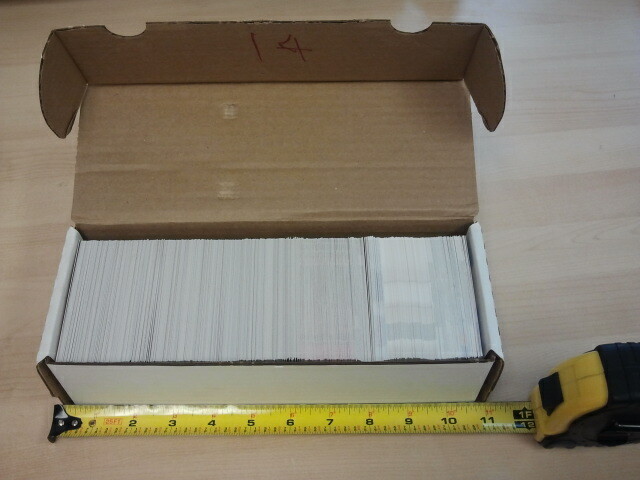 The number of cards you can fit in a 550ct is dependent upon the thickness of the cards. Any cards that don’t fit will be processed with our One Month processing service. Thanks for the reply. I just found 1 550 count box!! But if I send in more at least then I can first put them into the 550 count for size and then transfer them to the 660 for space. Right? And one last question. I have been a buyer on your site for over a year, so Im looking to become a first time seller. Can I use the $20.00 coupon for first time sellers towards this $55.00 special? If every seller on here used those free tools this site would have all the advertising it needed. I am happy Tim is doing some advertising but we have NEVER relied on a venue to get the word out for us. Good point. Our theory has traditionally been to invest anything that could have gone towards advertising or marketing into customer service or running promotions for our current customers instead. We believe that word of mouth is the most effective form of advertising, and we figure that if we have thousands of happy customers they would tell their friends. This is not only effective, but it is also a cost savings that we pass on to you. Though our tactics may not have been standard for start-ups, I do have to say that I have been very pleased with the results. We have consistently doubled our work force every year, and that is just about as fast as I want to grow. Any faster and it is really hard to maintain standards and quality. Now that we are much larger, we can afford to do some advertising, but we still want to make sure the quality of our service is so good that people will want to tell their friends about us. Also, im sorry if this question has been previously addressed but do we have a final decision on if the hidden shipping charge will be added to current inventories as well as future submissions? We have a meeting with Beckett scheduled during the National. Our current licensing agreement doesn’t allow us to display publicly visible prices outside of CheckOutMyCards.com. So at first COMC.com will only show book value to the original consignor of an item. We will be figuring out the specifics of how users can opt-in to see Beckett values on everything. We will also consider publishing a “COMC value”, but that is not currently very high on my priority list. COMC.com will bundle the per-item shipping with the seller’s asking price into a single list price for all items new and old. If the per-item shipping has already been paid on an item, the seller’s asking price will be the same as the list price. CheckOutMyCards.com will continue to keep the prices separated. You will see this in action in a few days. I asked this before but don’t think it has gotten a reply. Is there any truth to the rumor of a app for smartphones? No app yet, but it is on our to-do list. Hopefully we can speed up our schedule once we hire another full-time developer. On the subject of advertising. Are you guys responsable for the fb page named (comcers comcers). As you no I am new and was looking for your page when I came acrosss this. Just wondering if its yours. Interesting. I recently ignored a friend request from Comcers Comcers. I didn’t realize it had anything to do with COMC. http://www.facebook.com/CheckOutMyCards is the Facebook page. We are not affiliated with that page. I believe it was created by one of our customers. Brand recognition is important so the additional advertising is great news. Even if they don’t use the site for buying or selling, every collector should be aware that COMC exists. I originally became aware of COMC through a Google search when I was hunting for an elusive single to complete an insert set. At the time, I wasn’t active on any online boards, so I never benefited from word-of-mouth. I wish I has known about COMC earlier. As both a seller and a buyer, I would prefer card owners not send in cards, un-sleeved in these types of boxes, too easy for damage to the surfaces and corners to take place. Those of you who have opened factory sets that have been dropped or handled rough will know what I’m talking about it. All of the cards I send in are at minimum, in penny sleeves, with some of the higher value cards placed in top loaders. People who aren’t real concerned about condition this wouldn’t apply to, but some people like to have the best condition cards in their collection. Just thought I would throw that out there. I’ve received sleeved cards that have dinged corners from being dropped (or thrown), probably by the p.o.. The side of the box was also damaged, that’s how I know cards were ok when put in box. There are no guarantees. I put cards in team bags before they go in the boxes. It’s cheaper than sleeving every card and takes up less space, but protects them just as well if tightly packed. Great advise on the team bag will give that a try……. I wan’t to take advantage of this offer. I have a comcs $20 card so I will send that in with my 550ct box so i’m quessing it would only cost me $35 right? Yes, first-time-sellers can double up and get a 550ct box processed for only $35. I just scrolled through the comments and questions, but didn’t see this ask, if I missed it I’m sorry. As far as takign advantage of the $55 deal and mailing them in. Do we need to include the submission form or just a note in the box stating anniversay special and our user name on each end of the box? Thanks in advance. Just a note on the box with your username and “5th Anniversary Special” should be fine as long as it’s legible and your account is funded. Tim pretty new to this (been buying some) and getting a box ready to ship out….If you do not mind tell me about first time sellers it sounds like there is a discount and what happens after the cards are in the system on your side like setting prices things like that….I am sure the answer is here someplace but straight from the source is always good…. Hi, Craig. I would definitely recommend that anyone sending in multiple boxes for the special pack those boxes into a larger box with lots of padding. What about Ginter minis? How should we box them? 550 count box is about the only size i don’t have in stock – so i will have to send them in a larger box, i have read that this is fine – and you will put them in 550 size box for me – good stuff. Only problem i have is as i am sending them from outside the USA hiting the 1st – 6th August window could be a little of a problem, i should not be far off it, but international shiping can be a pain. All so we do not book these in any other way – the user name on the end is all that is needed? User name and the deal: “5th Anniversary Special”. As long as your package is postmarked between the 1st and 6th you’ll be eligible. Woo hoo! Glad to see this! I have a bunch of cards to send in and I just sold 40 bucks worth of cards in the last couple days, so I shouldn’t even have to mess with paypal. Thanks for the deal! Are 550 count boxes of mini parallel cards (e.g., A&G, Gypsy Queen, T-206, etc) permitted as part of the $55/550 count box special? Thanks for running the special – very helpful. As long as they are packed very carefully so that the cards cannot slide around in transit and get damaged, A&G and other minis are fine. Does anyone know the best way to ship one of these 550 ct boxes? Thus far we haven’t been able to accept cards at any shows in CA due to import law headaches, but we’re working to develop a good solution. Keep an eye on the blog, we’ll definitely post as soon as there’s news on that front. what’s the best way to minimize shipping costs for all 5 boxes? I use the priority flat rate boxes and of course I could fit 4 550 boxes perfectly in the large box, but then I’d have to ship the 5th separately! What’s the best trick? Use the board game large FRB. You can stack 5 on top of each other and then fill the space on the side with peanuts (or candy — they deserve it). Thanks…I’ll have to see if I could find one at my local P.O. today! Be careful about advertising on Facebook. Most of the incoming clicks will be from bots, and Facebook will charge you for them nonetheless. Hm, interesting. Have you had facebook advertising experience personally? We’re always interested in learning from others; shoot us an email if you like, we’d value your input. Still having a tough time swallowing the whole pay cash out fees on the money you keep. Cash out is realistically 25%…. Cash out $1000 and your fee is not $200 absorbing $1200 total it is $1240 because we pay an additional 20% on the money comc keeps. You’re mistaking a “surcharge” from a “fee,” legally. You aren’t paying a 25% surcharge. You’re paying a 20% fee. so again why should we pay 20% on the money that comc keeps? Comc has to make money also..the 20% cashout fee is quite fair..I cash out $6,250.00 to get $5,000 every few months and i am totally fine with that. Larry the 20% is the biggest cash grab by COMC…We don’t like it. We think it is too high which is why we don’t cash out. We have cards shipped to us that we sell locally and by the time we are done we get full value (or more) for the money we earned here. That said the fee is a cost of doing business here. They can ask for it and as long as folks are willing to pay it, they won’t change it. How exactly is COMC suppose to make money without the cashout fee’s? The processing fees might break them even on the labor cost. The same money gets rotated around and around and COMC isn’t making a dime on that. 40 employees, amazing customer service, HUGE building, Advertising, insurance on our items, and server/programming. 20% seems like a lot until you realize there is no other alternative and they wouldn’t exist without it. You gotta pay to play. Adjust accordingly. Don’t like it? Check out Sportlots fees, especially for the small time seller. Brian agreed…that is why we don’t sell there… Not to mention the site looks like a late 1990s setup. It certainly could use a lot of streamlining. I find it sometimes difficult to navigate when I’m trying to browse a specific dealer, but I must admit I’ve completed a lot of sets at $.18 cents a pop so it does have some advantages for the buyer. As someone who has run a Sportlots store I can tell you it is not cost effective at all. It’s hard to make money when an 18 cent sale often costs the seller 19 cents in fees. Quick question: Is the plan for all the 5th anniversary submissions (including my three boxes) go up on the site in the same week, or will parts of multi-box submissions be released earlier to allow cards to flow on more naturally? That would also mean that someone like me would be able to price their cards in three 500-card groups instead of 1,500 unpriced cards received all at once. We will process the cards as quickly as we can. Some people may get their items deposited early, but is hard to predict which batches may end up being early.